For the Maker’s Summit this past weekend I felt the need to make myself an outfit. What is a conference for makers without something handmade, right? I really wanted to play around with some of my chambray and make a tunic but ran out of time and needed something quick and easy. This Liesl + Co pattern seemed to fit the bill. I bought this pattern and the Everyday Skirt several months ago when they were having an online sale, but had yet to actually make them. Still waiting to make the skirt, but as the weather warms up I’m sure I’ll get the urge to try it out. Side note: Editing polka dot pictures does crazy stuff to the eyes! This shirt was a very simple, straightforward pattern. I didn’t have the time or willpower to make a muslin so I decided to just go for it and make a size I thought would fit based on my upper bust measurements. (Gasp…lazy sewing!) Liesl recommends doing a FBA (full bust adjustment) if you are a C cup or larger, but even though I am (at the moment- thanks to nursing it changes on a monthly basis- LOL) a C, I couldn’t be bothered. In retrospect I probably should have because my bust darts are way off, but everything else worked out great. This was one of those situations where everything could have gone terribly awry and I end up trashing the end result, but I am so happy to report that I got lucky and ended up with a shirt I will actually wear! I did go back and change the side seam allowances from 1/2″ to 3/8″ to give myself a little more wiggle room. I left out the pockets because I didn’t want to spend the time on them and didn’t think they were really necessary with the type of fabric I used. 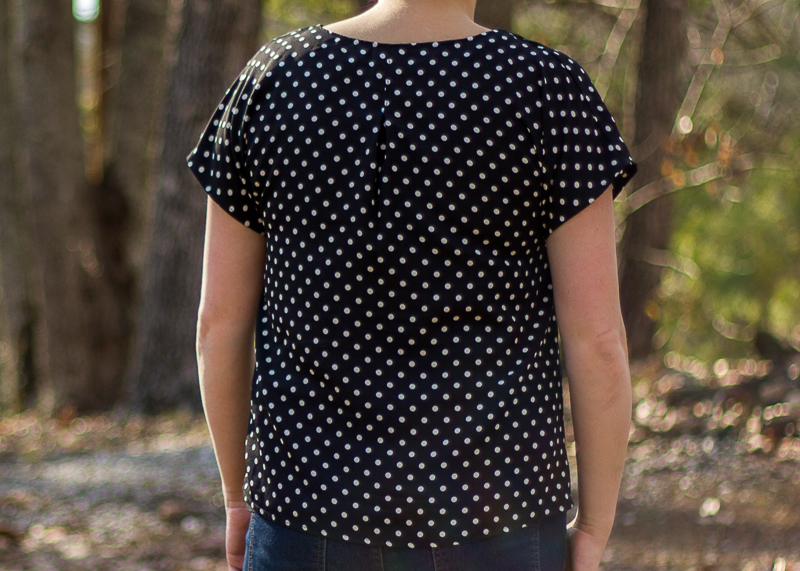 I really like the little inverted pleat at the top there…it’s a fun detail. Fabric used: An unknown silky-ish fabric picked up when I got to hang out with Deborah at a fabric store in Atlanta last fall. There is no selvedge info so I’m really not sure of the fiber content. This was one of my first times sewing with such slippery fabric, and it made things a bit tricky but not super unmanageable. I’d like to make this pattern again in a chambray or similar fabric and see how the sewing goes. 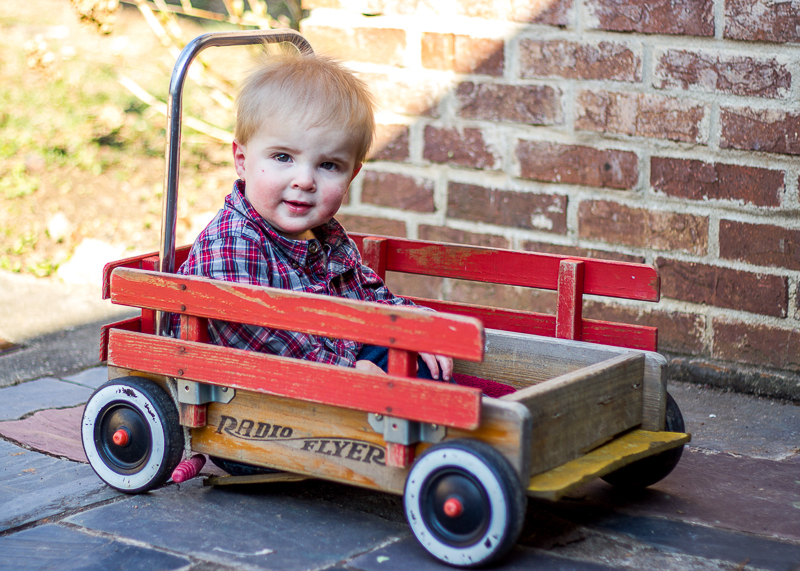 And just for fun I had to throw in this gem of my little photographer’s assistant directing the shoot from his wagon. 😉 What a sweetie, huh? This entry was posted in Selfish Sewing and tagged handmade blouse, liesl + co patterns, oliver + s patterns, weekend getaway blouse by oliver's fancy. Bookmark the permalink. Very cute blouse! I love polka dots. Would you recommend this pattern for a complete newbie garment sewer like me or is there another blouse pattern you would recommend instead? I think that this would be a perfect pattern for a complete newbie- as long as you don’t use a fabric that’s too slippery because that causes unnecessary frustration. The nice thing about it is that the flowy nature of the shirt means you don’t have to worry about the fit so much. And the short sleeve version has no sleeves to inset! I also think that the Ruby top by Rae is an easy top for beginners. Great blouse! Your work with the fiddly fabric was worth it. Thanks! It has definitely inspired me to experiment more with different fabric substrates! Pingback: Let the Spring Top Roundups Begin!